Super Horse Saddlery is a family owned and operated, Australian business, selling equestrian products online. “Born out of our love for horses, the team at Super Horse Saddlery strive to offer our customers a wide range of quality equestrian products at affordable prices.” Yvette Harmon, Owner. The Super Horse Saddlery eCommerce website includes a large range of products for the rider, horses and show events. 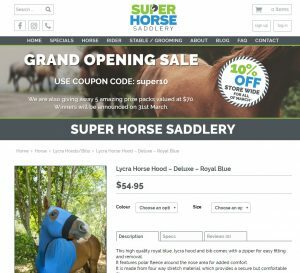 The Super Horse Saddlery website provides customers with a very easy to use “add to cart” system and a secure check-out page for paying for your order.